When I was a kid, it was all about shake and bake chicken. There is always a fad.. a shortcut.. and something processed. All the big supplier companies have to do is make it about convenience and competitive pricing… and it’s a wrap! It’s also fun! They made it fun- shake and bake was/ is fun and now this fake stuff that I am tempted to try- oh.. it’s fun too. It’s fun, easy and delicious and then we wonder why we get addicted and why years later we are filled with carcinogens. It started when a vegetarian friend of mine brought in a pasta with fake sausage one night. I didn’t of course want to eat the pasta so I tasted of few sausages bites. That is just not right. Sausage used to be one of my favorite meats. Now I cry when people around me eat pork. I have chosen pigs and their meat as the first type of meat to give up. Of course I am assuming that most humane people don’t eat veal.. right? Often I hear people giving up red meat.. why? Because of the saturated fats I guess.. not generally because of an incredibly stressed farming system. Anyway pigs have intense sensitivity and intelligence. It shouldn’t matter which animal feels more than another- they all FEEL. It’s animal abuse on every level. Anyway, sidetracked. I am talking about FAKE MEATS. I’m in favor of people eating fake meats of course to save the animals. Is it healthier? It’s healthier than processed animal products but I wouldn’t go so far to call it healthy. Here are a few ideas if anyone is interested in skipping a meat meal… perhaps a MEATLESS MONDAY. This is good for those transitioning to vegetarian or vegan. Better choices in the long run would include beans, legumes, tofu, tempeh, seitan, sprouts, nuts, seeds and whole grains. Now that I uploaded the pictures of the dishes I made over the last few days, I feel a little guilty. They actually look really good, tasted amazing and are very convenient. I guess it’s a question again of the lesser of the evils. Evils here being the animal farming industry vs. the processed foods industry. It’s almost like voting in an election. Don’t get me started there- but know this from a food perspective, if you live in CALIFORNIA- PLEASE VOTE YES ON PROP 37! LABELING FOR GMOS! 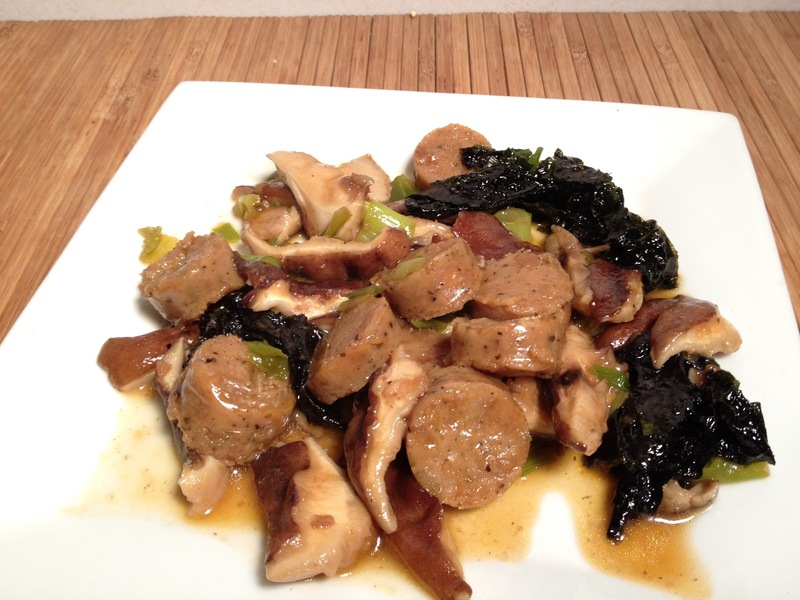 (1) Soy apple sausage with shitaki mushrooms and seaweed. I used mirin and olive oil for a light sauté and then finished it with hot sesame oil and shoyu. 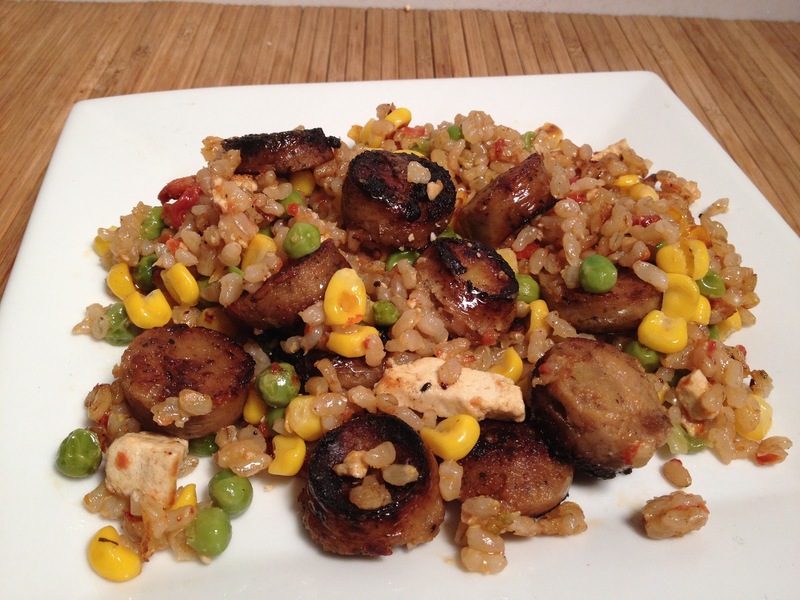 (2) Soy apple sausage with a mixed brown sprouted rice with tofu, corn and peas. I could and should make my own brown rice mix but for the record, they sell it in the macro/ vegan section in most health food stores- delicious and nutritious! I just sautéed the sausage in some olive oil and warmed the brown rice mix right into it. 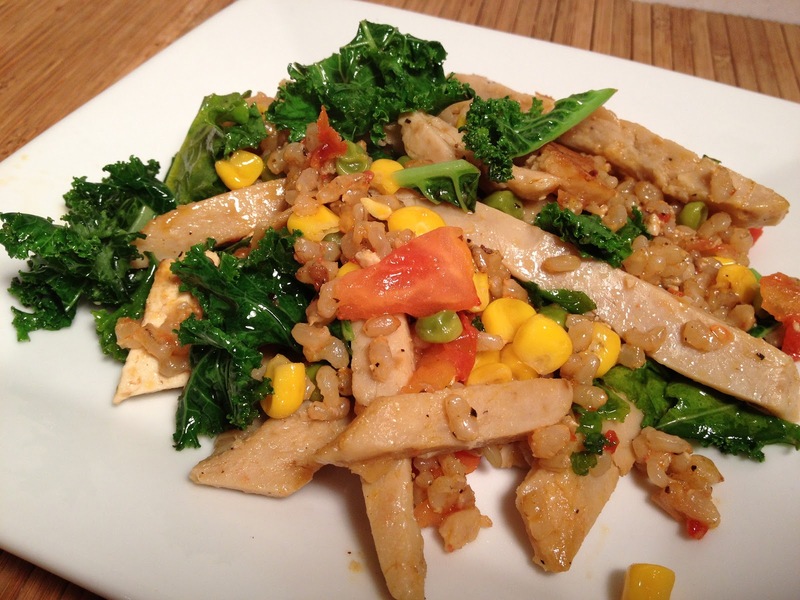 (3) Soy chicken strips also sautéed with olive oil and warmed with the same brown rice mix from above. Skipped writing days 270-278 sorry!